​Since 2001 there has been over 50 listings on the Stockholm Stock Exchange. During this period, private equity sponsored close to 50 % of all listings. Private equity IPOs have generally been good investments with an average yearly return of 8 %. This is better than the market and as good as/better than non PE IPOs. 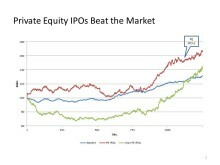 There is no evidence of market timing from PE IPOs compared to non PE IPOs.